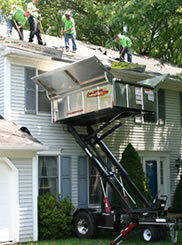 B&E Roofing offers both residential and commercial roofing services in PA, NJ, MD, and DE. We pride ourselves on giving you a new roof with no mess, while protecting your landscaping and shrubbery with our roofers buggy. Our customers are always impressed by our equipter and satisfied with our quality roof installation. If you are in the Harrisburg, Lancaster, West Chester, York, Kennett Square, Reading, King Of Prussia, Berks County, Lebanon, or Conshohocken area and need a roof replacement or roof repairs, contact B&E.